The Shire of Carnarvon is situated 902kms north of Perth. It has a population of around 6,800 and is 53,000sqkm in size. The Shire has over 1,526kms of road of which more than 84% is unsealed. Renowned for fishing, beautiful coastline and a rich heritage, the Shire of Carnarvon is a popular tourist destination. It also has strong horticultural and pastoral industries. March 2018 - Congratulations, Andrea Pitcher! May 2017 - Turn It Off, Bag It Up! Will You Take the Pledge? 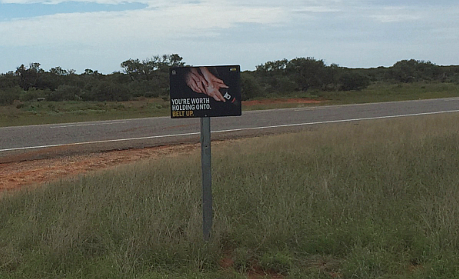 Pictured above: A seat belt reminder sign at the Edaggee rest area on the North West Coastal Highway. Pictured above: Bevan Dart and Vicki Della Bella with their mobile phone pouches. To find out more about the Carnarvon RoadWise Working Group email Senior Road Safety Consultant Engel Prendergast.